At the end of my first two semesters in graduate school, I think I know just enough now to know that I do not know what I want to study or how I want to study it. I am still interested in networks, leadership, and change, but do not know the level at which I want to resolve those ideas, much less how I would study it. Much of the work I want to do this summer and fall is searching for a conceptual frame that helps me describe my observations in a way that moves understanding (mine and research generally) forward. I’m beginning this here with Communities of Practice. Reading this was slow, especially coming off of the three previous books I’ve written about (Connected, Where Good Ideas Come From, and Disrupting Class), which were popular nonfiction, written to be engaging to a general audience. 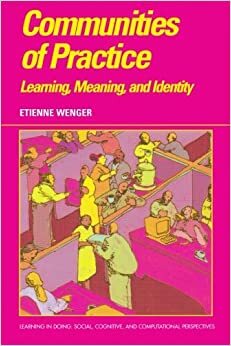 Communities of Practice is definitely aimed for an academic audience, and “presents a theory of learning that starts with this assumption: engagement in social practice is the fundamental process by which we learn and so become who we are.” This assumption is not how I have previously conceived learning. I think it is pretty typical in a Western, individualist society to think of learning as something individuals do, with teaching as something we do to others, not as something created between us. Engaging with this theory, and with the theoretical framework of distributed leadership, has challenged me to see the world differently. I see the value: both give a better explanation/understanding of what we observe than those that try to understand people’s actions as isolated. It’s still hard for me to stay in this mind-space as I try to understand interactions, like in my own research, but hopefully this will come in time as I become more familiar! Seeing actions as embedded in historical and social context is something that can feel artificial, but as I began to look at this, it makes sense. When I think about everyday actions, like eating breakfast, I don’t necessarily see the history and social context of it. It’s there, but it’s not really helpful. I think unpredictable or seemingly illogical acts might make this easier to see. I am writing this two days after the shooting in a black church by a white man. He killed 9 people. Some (white) people have responded to say that this is incomprehensible – why would he do such a thing? The historical and social context is critical in how this situation is understood, and increased understanding of the context might move the conversation forward. When I have previously tried to understand school leadership, usually in the school that I was working, my view of the social context of the actions was myopic, because I couldn’t have the full perspective. As a researcher, it will be my role to find levels of social and historical context that give structure and meaning to observations. 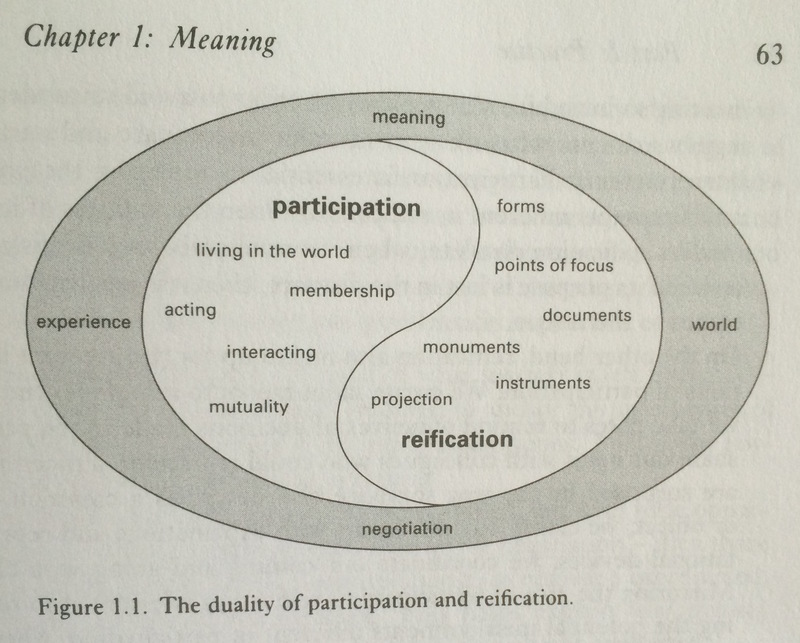 The idea of a making meaning as negotiating the duality of participation and reification resonates with me and with my experiences. It is essentially what I am acting out right now as I write this: I type and delete words, restart sentences, rearrange thoughts that I am attempting to represent through a common language. Meaning emerges – one for me (better understanding of what I’m reading) and one for you, the reader (new ideas, perspective). The question I continue to wrestle with is “at what level of negotiation should I pay attention?” The level of word choice in a meeting or the level of yearlong aggregate actions? Probably that unsatisfactory answer, “it depends” on what I want to understand. As someone usually looking for where innovation and change is happening, Wenger writes about “peripheries” as a space where communities of practice connect with the rest of the world: “casual but legitimate access to a practice without subjecting them to the demands of full membership.” (p.117) This reminds me of the affinity spaces that James Paul Gee writes about. This loosening of “mutual engagement” at the periphery means that “the periphery is a very fertile area of change.” Boundaries, edges, transitions… good places to look for interesting things. In Chapter 5, Wenger addresses “Locality,” zeroing in on what I’ve been thinking about – what social configuration is worth studying? “the notion of practice refers to a level of social structure that reflects shared learning. Note that this is a level both of analysis and of experience…. In a sense, communities of practice are an analytical category.” (p.126) “The landscape of practice is an emergent structure in which learning constantly creates localities that reconfigure the geography.” (p.131) Ultimately, changing your view is a series of trade-offs, where reducing complexity in one direction increases the complexity that comes into focus. It is not about deciding the best one, but rather it is deciding between the trade-offs. I will leave off here at the end of Part I and return with Part II. I’ll leave my quotes below for the first three chapters, but beyond that I started just noting important passages in my book because dictating quotes into Evernote started to get tedious. What is the difference between community of practice and culture?